Look at the picture above. What is the most likely cause for this woman's upper lid appearance? of levator dehiscence. The most most cause is involutional (ie. age-related). Other possible causes include previous intraocular operation and trauma. How would you classify ptosis? What is meant by pseudoptosis? Give me some examples. Pseudoptosis refers to the appearance of ptosis although ptosis is absent. 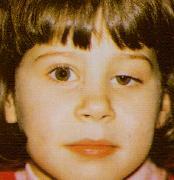 Here is a child with ptosis since birth. What would be the most important examination? Testing of visual acuity and refraction. Congenital ptosis is associated with ametropia especially astigamtism. If the vision is down and the patient is ametropia. Glasses will be required to prevent amblyopia. How could you decide clinically if this child's ptosis is caused by a dystrophic levator? than 10 mm. In addition, it fails to relax on downgaze so that there is lid lag when the patient looks down. What other ocular sign may be present? The ipsilateral superior rectus may also be maldeveloped resulting in poor globe elevation on upgaze.